These are the drive plates we use in our Camburg 2.50 rear race hubs. These are CNC machined in-house from 4340 chromoly, then heat-treated, stress relieved and electroless nickel plated for corrosion resistance. These are the drive plates we use in our Camburg 2.50 rear race hubs. These are CNC machined in-house from 4340 chromoly, then heat-treated, stress relieved and electroless nickel plated for corrosion resistance. 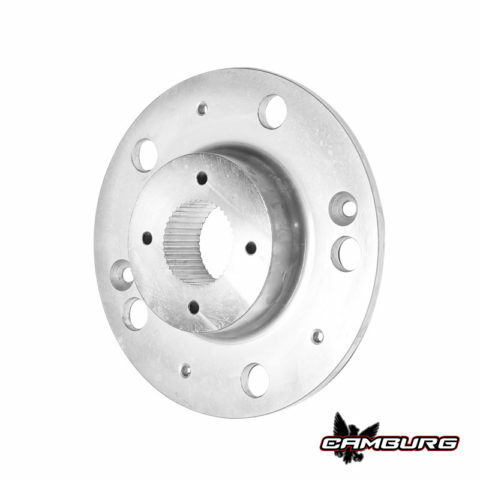 They are available in 5 on 5.5″ and 6 on 5.5″ bolt patterns for either 35 or 40 spline full float axle shafts. For the 6 on 6.5″ TT bolt pattern we offer them for either 40 or 45 spline axle shafts. Unlike some, we precision broach our axle splines for a tight fit. Sold individually.